Lisa felt bad leaving Poppy out of the mix so we have finally made something for her! She’s got her own coat! 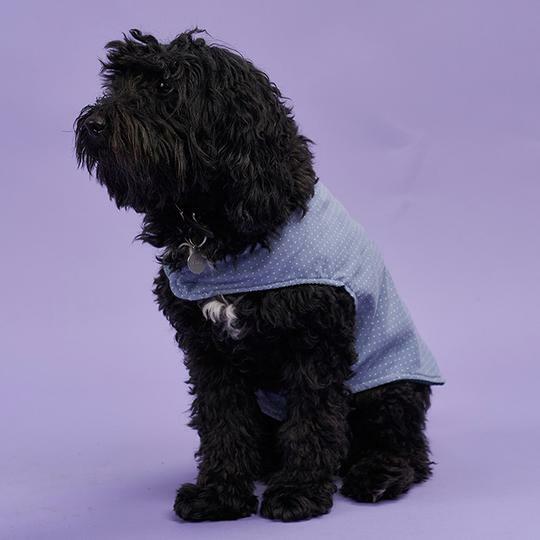 This little dog coat is reversible so you can choose two different fun fabrics. How about a cosy fleece layer on one side and a smart corduroy on the other? The coat fastens with velcro and is super simple to sew and easy to put on your pup. The Poppy Dog Coat is a beginner level sewing pattern. We recommend medium weight fabrics such as cotton, wool, tweed, corduroy or waterproof wovens. You could also use fleece or knit fabrics as a contrasting fabric. See the chart for details on fabric requirements. For reference, Poppy is a Tibetan Terrier/Poodle cross and she wears a size small. A PDF pattern is a instantly downloadable pattern that you print yourself, either at home or at a professional printers. At the end of the checkout process, you will receive an email with the link to your pattern and instructions. When printing, always make sure the scale is set to 100%. (You might have to uncheck the scale box.) For the A4 and US letter versions, print the first page only first to test the scale.